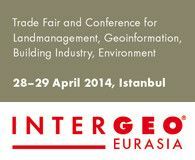 Meet us at INTERGEO Eurasia taking place at the WOW Convention Center in Istanbul from April 28 – 29, 2014. EUCLIDEON’s and MEIXNER IMAGING’s latest software packages are presented by our distribution partner Atay Engineering Co..
Come by our booth and meet us in person to learn more about our innovative technology. Dr Philipp Meixner will be happy to provide you with a demo and answer your questions.